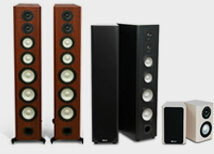 It's a given that good loudspeakers require cabinets or enclosures to do what they do best imitating the sound of real musical instruments and human voices whether on CDs or in movie soundtracks. Loudspeakers have to move lots of air molecules in order to produce sound, so the rules of physics demand that speakers have appropriate enclosures in order to produce powerful deep bass and clean undistorted sound. But it's those same cabinets or boxes that become the bane of spouses and interior designers who are trying to achieve a certain look to a particular room. The first impulse is to try and hide speakers, or instead choose tiny inconspicuous cubes or orbs that house small little drivers (drivers are the cones and domes that move air to create sound waves). The impulse to hide speakers is generally one you should avoid. Sound quality will suffer drastically if you try and bury good speakers inside something else—special cubbyholes in custom cabinetry or the like. Speakers need to be open to the air they have to move in quantity, and they can't do that concealed in an armoire or from behind a fancy latticework wooden grille. Nor are the unobtrusive little cubes a solution. The weak little drivers may work in a small den, but they can't begin to generate the big, compelling sounds of a full orchestra, band or movie soundtrack with anything approaching real fidelity. Consider a hybrid in-wall speaker with a finished real wood veneer trim that will complement rather than sully the furnishings and décor. While we don't suggest you get speakers that are concealed within the wall or ceiling, there is a real alternative that combines excellent sound quality with an attractive appearance: a hybrid in-wall speaker with an exterior finished frame and the bulk of the speaker enclosure inside the wall. It's precisely designed to duplicate the sound quality you'd get from a comparable bookshelf speaker. You will have to choose carefully where to install a hybrid in-wall, because holes will need to be cut into the wall. But once installed, the wiring can be routed inside the wall to the AV receiver, resulting in an almost invisible installation that sounds excellent. Consider custom-finished beautiful real-wood veneered speaker enclosures. If floorstanding speakers are recommended or required for bigger spaces and great rooms, go for custom-matched real woods that blend with and enhance the décor. You can order samples ahead of time and match the finish of the speakers to the decorator's or your partner's requirements. For dual-purpose rooms, get an electric projection screen that's hidden behind a valance and descends when you want to watch a DVD or TV show in surround. 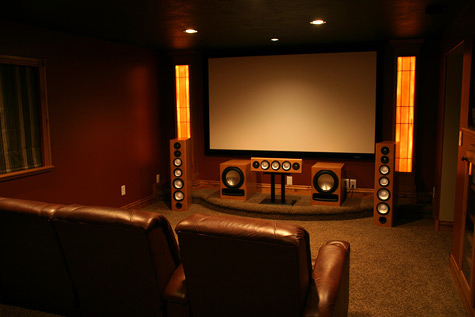 Depending on your lifestyle, space and budget, you may want to have your home theater be part of a central family room or living room, rather than having a dedicated theater room. It's not that difficult to accomplish. Quiet, smoothly descending electric screens with remote controls can be installed behind a valance finished to match the surrounding wall or woodwork. When you're in the mood for a DVD, a touch of a button lets the screen descend for viewing and retract out of sight at the movie's end. Modern DLP (digital light processing) or LCD High-Definition video projectors are so compact that they can be unobtrusively installed on the ceiling with the supply cables run inside the ceiling. Control of the projector is enabled with a remote that bounces off the screen surface. 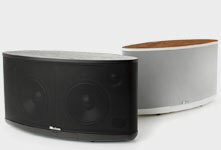 Use the subwoofer as a nicely finished end table or support for a lamp or plant. Subwoofers the big boxes required for ultra-deep bass don't have to be ugly. You can order one in a highly attractive real-wood finish and locate it at one end of a couch as an end table to support a lamp or plant. The versatility of surround sound acoustics allows for the subwoofer to be placed almost anywhere in a room because we don't hear direction from low bass energy. 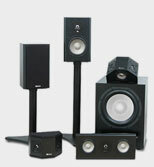 So the subwoofer does not have to be at the front of the room near your front speakers, screen and video display. As often as not, it may in fact perform better at the side or the back of the room or, in some rooms, off in a corner. Unlike good speakers, the electronics, DVD players and amplifiers can be hidden away in attractive custom cabinetry, a refurbished closet or a special niche in the wall. The house wiring that powers your lights and appliances is hidden inside the walls of your home. In the same way, the versatility of modern electronics and cables lets you do that for the AV receiver, DVD player, and amplifiers that you'll need to power the speakers. You can house the electronics in custom cabinetry or a redesigned closet, so long as you add an accessory muffin cooling fan to ensure proper air flow. 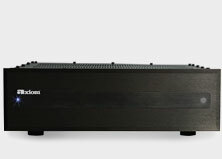 If you don't wish to display powerful separate power amplifiers for larger systems, they can be put out of sight in a cooler basement room with the audio-video processor/controller upstairs in the viewing area.